Want to change your tree this year with new decorations but with the budget crunch you think you just can't afford it? Well, here are four trees using things you have around your house or can buy at your local thrift store so you that you can create a one of a kind tree. Of course these are just suggestions but let your imagination roam, I am sure that my suggestions will spark an idea or two. Do you have a bunch of Christmas mugs that you have received as Christmas gifts? Tie a ribbon on the handle of your mug and tie it to your tree. To continue on with this theme hang some hot chocolate packages. White lights, Red and green bows and you are done. You could also use a simple Salt dough and make cookies that will last for a couple of Christmases. You can use the little squeeze bottles of acrylic paint to "pipe" on the frosting. This could also be done in teacups. Wrap a bow around some of your favorite teas and put them on your tree as well. Wrap a ribbon around your teaspoons and hang them too. Use a few of the balls that you have from last year and you will have a beautiful tree. Are your kids into the Transformer craze? Gather all of their Transformers together and nestle some in the branches of your tree. Add some lights and some balls from last year and you have a great boy's themed tree. Only little girls at your house? Do a Barbie tree, Dress them in their finest and nestle them in among the branches and add some big bows and some silk flower roses. Merry Christmas Barbie! Why not do a natural tree, Collect some pinecones and small branches. 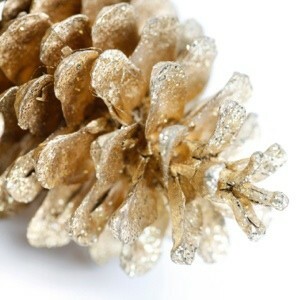 Coat pinecones with glitter. Make small bundles of branches and put a pretty ribbon around them. Buy some baby's breath and silk flowers and make small bouquets for the tree. Beautiful and sweet. Any natural thing can be dried and spray painted for this project, Mixed Nuts, pods and seeds to just name a few. Make a popcorn garland or a cranberry garland and you are set. Hot glue a small bow on any of the snack size candy bars or individual candies and hang these on your tree. This is a great way to use that left over Halloween Candy.Make a cute garland by taking small drink cups and glue the tops together and then wrap in colored cellophane. Then take a piece of yarn on a large needle and going through the cellophane to link them together. Three candy canes can be wrapped with ribbon and a little bit of baby's breath. You can also make a simple salt dough and make some cookies for your tree. Add some multi colored lights and your tree will be a hit with kids and adults alike. Fabulous ideas, cant wait to try one out especially like the nature tree. Great ideas. You can make a wreath out of pinecones by using a strofoam ring and just wiring the cones to to the wreath. Spary paint the whole thing with white paint and them sprinkl gold glitter on top. It turen out really pretty and cheap and easy. You can also add some red berries to make it even more festive if you like. One particularly lean year we simply took holiday cupcake liners, put hooks on them and put them on the tree. We used a combination of tinsel and crinkle ribbon that we curled by running it over the edge of a scissors. Total cost for decorations, less than $10. We also waited until Christmas Eve and bought the tree for $10.